Time to write an obituary or imagine a new beginning? Writing a book about Europe is not the best way to boost your pension contributions in the current climate. . It seems that precious few people care anymore about the European Union. Of those that do care, a growing number are likely to be unemployed and therefore unable to afford the high cover price of limited print-run titles. Comedians might joke that future European-focussed titles will be shelved under ‘esoterica’. However, a high-volume of sales may not always be the main goal for authors writing about Europe. Indeed, many appear to be fleshing out their individual or collective versions of the European project. They are attempting to create a future rather than reporting on the past, or even narrating the present. Their goal is maximum impact among political leaders instead of maximising sales to the general population. Catching the current range of European titles being published highlights a range of central concerns driving the current discussion about the state of Europe. 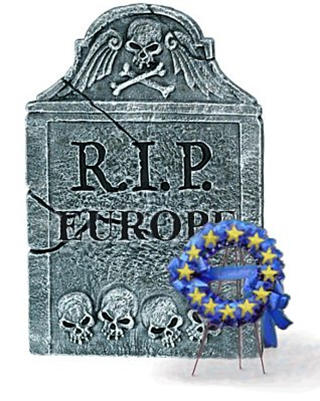 Some appear to be writing obituaries for the European dream whilst others remain committed to the sense that Europe still has a future, albeit a potentially rather different future. Jim Memory’s excellent article in an earlier edition of Vista has already very helpfully outlined this perspective. His continuing attention to this area is justified in light of the fact that the greater majority of books written about Europe in the last few years deal with the ongoing European ‘crisis’. Jurgen Habermas’s The Crisis of the European Union: A Response (2012) is a good example of a book that responds to a debate that is framed largely as an economic or socio-economic crisis. He argues for increasing the process of democracy and participation in Europe, described by reviewers as an ‘influential European reflecting on their predicament’. It is undeniable that the last sixty years of post-war European experience seems to have left its institutions impotent and unready for the economic crisis that still threatens to overwhelm Europe. That may be so, but it would be foolish to overlook the fact that the EU’s unreadiness was shared with many of Europe’s national governments, their central banks, and their respective financial institutions. Commentators on all sides of the debate seem agreed that a way out of the current crisis will only occur as the community of European nations finds shared solutions that offer mutual benefit. There have been virtually no books published in the last five years that use the word ‘vision’ in their title. Visions, it seems, do not sell books! Authors who outline their visions for Europe generally wrap these up within discussions about the ‘future of Europe’. The greater majority of the discussions are generally political in character, including recent works such as Jean-Claude Piris’s The Future of Europe: Towards a Two-Speed EU? (2011). Guy Verhofstadt’s For Europe: manifesto for a post-national revolution in Europe (2012) and David Marquand’s The End of the West: The Once and Future Europe (2011) are examples of this approach. The European Commission understands the need to confront the current crisis with a new vision for Europe. In itself, this is telling. If the current crisis is purely economic, why must it be confronted with a new vision? Surely, it would be more effective to develop a new or improved economic theory? This tension underlies the under-reported speech ‘Confronting the crisis: New vision for Europe’, delivered by Commission Vice-President, Maroš Šefčovič, in February of 2013. Ultimately Šefčovič proposed economic reforms but these, he argued, will only be possible with “more Europe”. Central to his vision is a more transparent Europe in which member states and European voters place greater trust, a move towards the deeper political union that a common monetary policy requires, and a Europe with a more co-ordinated approach to fiscal and financial matters. This contrasts sharply with the British Prime Minister’s alternative vision of a leaner and less intrusive Union. Most commentators interpreted this as politically self-serving but many of these concede that there are constructive proposals contained within the wrapper designed to appease the Conservative party’s Eurosceptic wing. Federalist visions of Europe seem to be giving way to multi-speed visions, given recent momentum by threats from Mr Cameron and others that greater federalism will be actively resisted and is likely to result in increased, rather than decreased, fragmentation of the Union. Whilst the notion of a two-speed Europe is spearheaded by political leaders like the British PM, even the most enthusiastic federalists are beginning to concede that it may be politically necessary to permit multiple modes of belonging in order to keep the greater European dream alive. Despite this narrowing vision, Cameron remains committed to securing Britain’s access to a European single market free of unnecessary regulations. The bottom line seems to be ultimately what is in the best financial interests of the UK. Jeff Fountain’s book Deeply Rooted (2010) outlines the Christian vision underlying the contribution of Robert Schumann to the creation of the European Union. One of Schumann’s allies, Jean Monnet, once made reference to the biblical text “Where there is no vision, the people perish” in discussing the European project. Schumann and Monnet are good illustrations of the fact that all visions, especially those that inform public policies, are rooted in particular worldviews. These may be political, ideological or philosophical, among others. Worldviews may also be religious in nature. Christian versions of what makes for harmonious, righteous and good government (national and European) are not lacking and continue to drive the energies of a number of committed European politicians. Of on-going concern to European Christians should be the question as to whether the re-nationalisation of decision-making is divisive and erodes the credibility of existing European institutions. Key to this debate is whether there is a Christian worldview that allows space for an emerging European identity to sit comfortably alongside national identities without either of these identities subverting the primary loyalty that followers of Christ must declare in Jesus as Lord of all. The relevance of such a question is underlined by the fact that publishers seem to remain convinced that books dealing with religion in contemporary Europe still have a reasonably wide appeal. Lorenzo Zucca’s A Secular Europe: Law and Religion in the European Constitutional Landscape (2012), Lavinia Stan and Lucian Turcescu’s Church, State, and Democracy in Expanding Europe (2011), and the range of titles written by Grace Davie and Peter Berger suggest that the contribution of Europe’s religious communities in general, and Christianity in particular, continue to play an active part in shaping a future for Europe. Europe’s Christian activists, politicians, and lobbyists may not always capture the headlines, but they are active in praying for and outlining a future for the people of Europe that benefits all. They will not always agree among themselves about the best political programme to achieve those ends, but few will be content to let the story rest with a finale stuck on a note of ‘crisis’. The Gospel always requires more of God’s people, marked by the hope of redemption, resurrection, and restoration.